Location-based services are on the to-do list for many retailers to enable a more personalized shopping experience, but the myriad of technology options make the decision process complex. Within the last few years, a plethora of new location-based services (LBS) have been created for retail applications, however, selecting the right technology for retail applications can be an overwhelming task. 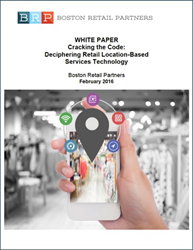 To help retailers navigate the sea of options, Boston Retail Partners (BRP) published this white paper: Cracking the Code – Deciphering Retail Location-Based Services Technology. Why are Location-Based Services Important? Location-based services are critical to identifying customers as they enter the store, which creates the best opportunity for retailers to personalize the customer’s shopping experience through clienteling and guided selling. In Boston Retail Partners’ 2015 CRM/Unified Commerce Benchmark Survey, 53% of retailers plan to have the ability to identify customers when they walk in the store via their smartphones within five years. That’s an 883% increase over the 6% who indicated they could already identify their customer in this way. Understanding the different technologies and how to best utilize them in conjunction with the customers’ smartphone is critical for the future store. With the growing interest in LBS technology comes a complicated path for selecting the optimal system. Coupled with the ever-increasing capabilities of LBS, even the savviest ‘techies’ have been left wrestling with the challenges of deciphering this complex technology. This white paper provides an overview of the nuances of the various LBS options and the pros and cons of the respective retail applications. The primary location-based technologies assessed in the white paper include: GPS, Wi-Fi, RFID, NFC and Bluetooth.